Thank you for your interest in the Internal Medicine Residency Program at UConn. I invite you to look through our website to view the highlights of our training program. 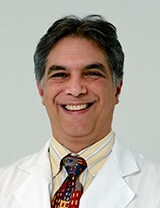 The mission of the UConn Internal Medicine Residency Program is to prepare physicians to practice optimal internal medicine in the United States now and in the future, emphasizing excellence in clinical skills, cultural competence, critical analysis of the medical literature, life-long learning, and systems-based practice, with the goal of inculcating a style of practice that is safe, is cost-effective, promotes health, and responds to the needs of U.S. society. We have designed a dynamic curriculum and a rich environment that promotes growth and independence and prepares our residents for the next stage of their career. Whether your goal is to become a primary care physician, a hospitalist, or a sub-specialty fellow, our flexible curriculum will allow you to explore all of your academic and research interests and individualize your educational program to meet your specific career goals. I encourage you to learn more about our program, our state-of-the-art training facilities, our innovative curriculum elements and tracks, and the greater Hartford area. We are proud of our program, our current residents and our graduates. Our commitment to providing excellence in training has made our graduates highly sought after for faculty and fellowship positions.